Part Amazing Race, part CrossFit Games, part Outward Bound, Operation Wildcat's goal is to build community through activity. LEXINGTON, Ky. (Oct. 17, 2017) — "Operation Wildcat" may sound like a police sting, but it's actually an opportunity for veterans and civilians to work together and solve a challenge that feels a lot like a military mission. Part Amazing Race, part CrossFit Games, part Outward Bound, Operation Wildcat's goal is to build community through activity. The event is open to military veterans and civilians of all ages and athletic abilities. Applicants will be selected in a "draft" and placed on diverse teams of up to 12 people. The teams will begin with warmups and team building activities and then begin working on a hypothetical "mission" that will mimic a real military exercise. The event ends with a "battle" on Kroger field that will put participants through a variety of physical challenges with their team. 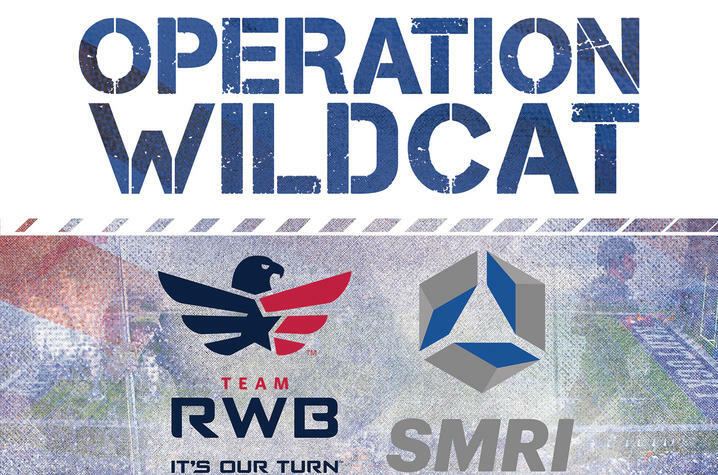 Operation Wildcat is a joint project spearheaded by the University of Kentucky Sports Medicine Research Institute (SMRI) and Team RWB. Team RWB is a national organization whose mission is to enrich the lives of America's veterans by connecting them to their community through physical and social activity. There were more than 32,000 Team RWB (Red, White & Blue) events in the U.S. in 2015. "The military model uses physical activity to build community and leadership," said Troy Kenning, Lexington chapter event coordinator for Team RWB. "This is a logical way to extend that to the civilian community and build relationships between veterans and civilians." The SMRI, part of UK's College of Health Sciences, is a multidisciplinary research center that studies injury prevention and performance optimization for civilian athletes and the tactical athletes of the U.S. military Special Operations Forces. "We were delighted to help with this event, as its goal aligns so closely with ours," said Nicholas Heebner, SMRI associate director for research and event co-director. "We made sure that all of the activity for Operation Wildcat was scalable — you don't need to be a triathlete to participate and have a great experience. It’s about teamwork and supporting your team members through physical and mental challenges"
Operation Wildcat will be 6:30 to 10 p.m., Tuesday, Nov. 7 at Kroger Field. Cost is free. To register for the draft, go here by Nov. 1.